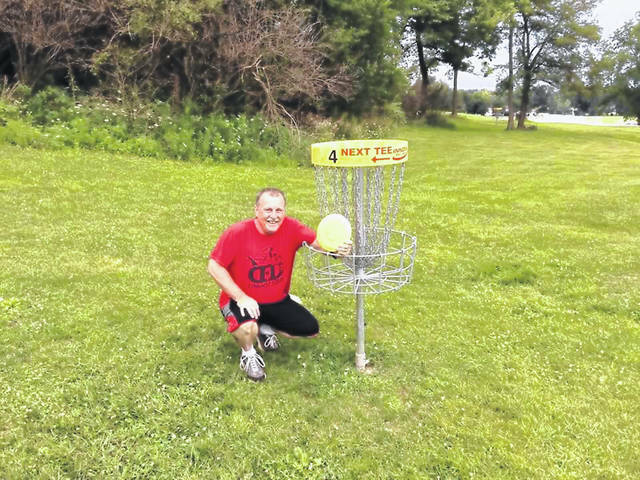 Jeff McCall poses beside the fourth hole of the disc golf course at Melvin Miller Park. The Hilltop Disc Golf Club will host the 2018 Hilltop Charity Classic at Melvin Miller Park on Saturday. This is the fourth year the club has sponsored the doubles tournament raising money to help the Caring Kitchen in Urbana. Tyler Bumbalough, city engineer and treasurer of the Hilltop Disc Golf Club, said that the 18-hole course at Melvin Miller Park has been rated the fifth best course in the state. It will be expanded to 25 holes for this event. The 66 teams will be positioned evenly throughout the course so that each hole is in play at all times, with a shotgun start at 9 a.m. Registration for this tournament ended in September so the club could order a player pack for each participant, including a couple discs and a shirt. A portion of the fees, $600, has been set aside for the Caring Kitchen. The largest contributor is expected to be the raffle of three disc carrying carts to be awarded during the tournament. Bumbalough said that last year’s event earned $700. While the Professional Disc Golf Association has not yet sanctioned a tournament in Urbana, Bumbalough said having an officially sanctioned tournament is a goal. The club hosts several other tournaments throughout the year, including the upcoming Over the Hill Disc Golf Tournament for players aged 50 and above, planned for Nov. 3, and Cousin Eddy’s 2018 Mystery Christmas Challenge, planned for Dec. 1. For more information on these tournaments and for registration information, visit www.discgolfscene.com/courses/Melvin_Miller_Park.